It's once again, Forget Me Not Friday! And the polish I didn't forget about is KBShimmer Don't Teal Anyone. 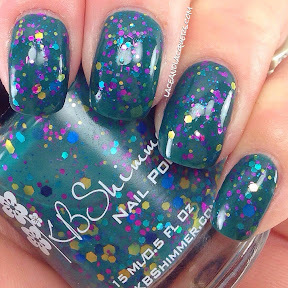 I wanted this polish ever since it came out... like 2012? 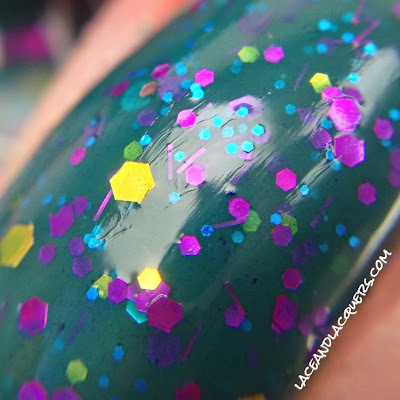 (Which is the last time I reviewed a KBShimmer on here) I believe it's discontinued now, but I finally can swatch it after buying it sometime last year hahahhaha check it out below! Don't Teal Anyone is a "deep teal base with, gold, teal blue, and fuchsia hexes in several sizes, and micro fuchsia bars". It is perfection *cries*. 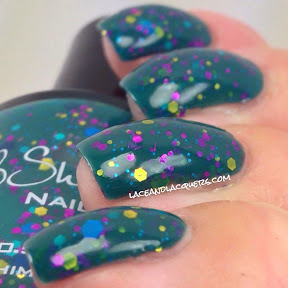 The base is such a gorgeous dark teal-y green and the glitter colors compliment the base perfectly. Almost peacock-y. I did 3 coats of Don't Teal Anyone. I was kind of iffy about how many coats this would be because the first one was quite sheer. It ended up building up nicely, happy Lacey. No issues to report with dry time, it was great. And there it is! The first swatch since 2012 LOL. I really like this polish, the base color is amazing and the glitter just makes it just a little bit more awesome. What's your favorite KBShimmer polish?